While structural steel’s cradle-to-cradle life cycle and environmental advantages are noteworthy, the real efficiencies and sustainable-related savings come from building design optimization. Interestingly, it takes the same energy to melt steel in an electric arc furnace, whether it is for a 36 ksi or 70 ksi end product. Higher-strength, ASTM A913 grade steel can also be welded with little to no preheat and is now available from a domestic steel mill. 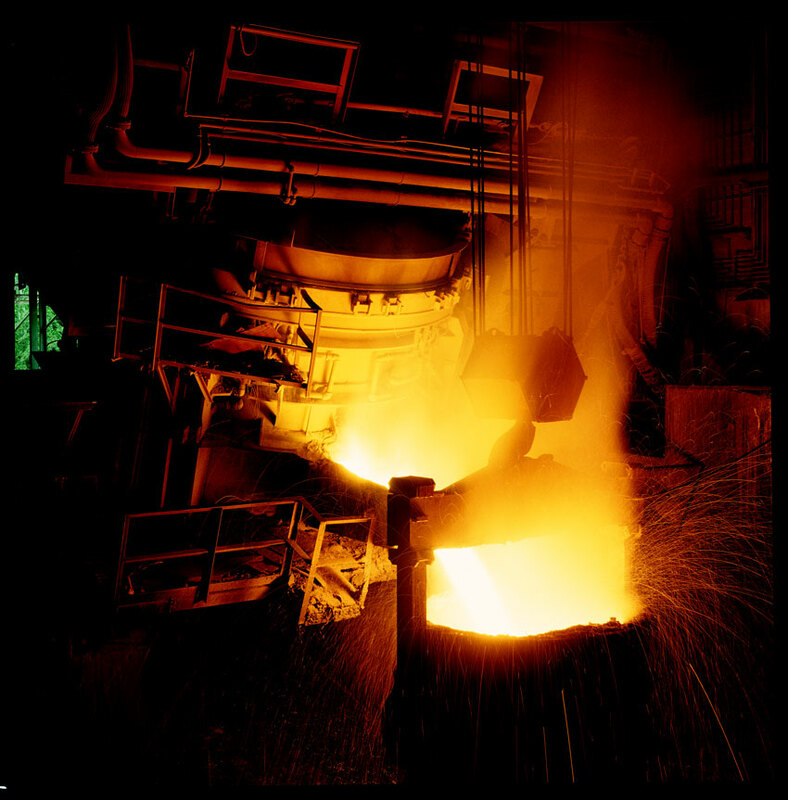 This electric arc furnace is discharging molten steel into a ladle where alloying materials and mixing will occur. Specifying domestically produced structural steel can also make a significant difference. Most structural steel produced overseas is not produced using the scrap-based, environmentally friendly electric arc furnace process that is standard practice in the United States. The unfortunate result of a choice to use foreign steel is to double or triple the environmental impacts associated with the steel. Composite design, where the strength of the floor system supplements the strength of the structural steel frame through the use of shear studs, can also be used to reduce material quantities and environmental impacts. The type of bracing system selected also impacts the amount of material used. For example, bracing in vertical planes between lines of columns provides load paths to transfer horizontal forces to ground level and provide lateral stability. Several types of frames can be used to handle a building’s lateral loads, including moment frames, chevron bracing, X-bracing, and specialty framing systems. Moment frame construction generally comes at a higher cost, but it will result in less material being used and a reduction in environmental impacts. Because the entire length of a beam or a column in a building is not subjected to the same level of load, a smaller section containing less material may be substituted if a plate is welded to the beam or column to handle the higher level of stress in a given region of the member. While this will yield a reduction in weight, the tradeoff between weight and the increased level of fabrication requirements should be evaluated in terms of both cost and environmental impacts. In some cases, it may be possible to use lower-weight members if the beams are cambered. If the fabricator has a camber machine in house, this is a great solution, reports Still. It should be noted that designers often specify all structural steel to be painted with a primer prior to erection. However, this is not necessary for members that will be in the interior of the building envelope and not subject to a corrosive atmosphere generated inside the building. Proper specification of fire protection materials can also reduce the overall environmental impacts of the framing system. Cross points out that a recent Underwriter Laboratories (UL) test, published as UL Design D982, indicates that within certain limits, the required thickness of fire protection for unrestrained floor assemblies is the same as for restrained floor assemblies. “Reflecting this in the building’s specifications effectively halves the amount of fire-protection material required for floor assemblies,” he reports. Perhaps the most important decision the project team can make to reduce the environmental impacts of the structural framing system is to engage a structural steel fabricator early in the design life of a project. The fabricator will be able to provide specific suggestions regarding the optimization of the framing system from both a material and fabrication perspective. 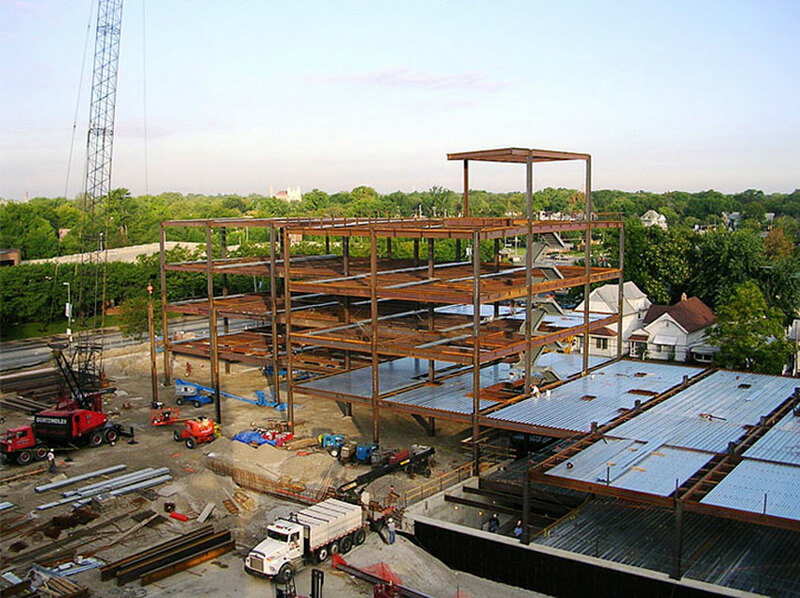 Pictured is the Mercy Heart and Vascular Center in St Vincent, Toledo, Ohio, under construction after the structural framing redesign included fabricator input. The fabricator has the expertise to advise the design team on the availability of specific shapes, production locations, and methods to expedite the fabrication process. “The selection of members that are stocked and readily available to fabricators in the project’s geographic area will save transportation impacts, the need for special rollings, and time in the overall project schedule,” explains Cross. Still points out that there is often a lot of pressure to specify “lighter” structures. However, lighter beams often require stiffening and more complex, time-consuming, and detailed connections. The early involvement of the steel fabricator will help assess the relative tradeoffs of these design decisions.